For their third Streicher Secrets file, Ashley, Jenn and Kristie, a sibling trio of highly sought-after red-carpet hair, makeup and brow artists, respectively, share their seasonal inspirations, favorite outings and expert advice for a fun and festive holiday. December is, by far, our favorite time of the year. From our annual Streicher sisters holiday party to the many hours spent baking (and decorating) cookies in Kristie’s kitchen, winter is full of family traditions, both new and old. Our newest include a quick dinnertime getaway to The Old Place in Malibu (so cozy!) and ice-skating downtown, while the tried-and-true include spending Christmas day snowboarding and listening to classic ’40s holiday music. And of course, there are all of the festive parties. ’Tis the season to bust out that vintage number you’ve always wanted to wear and invest in a beautiful coat, which will make you feel pulled-together all season. The secret to our merriment? The holidays are also about balance. You can feel the mixture of stress and excitement in the air, so it’s important to take a step back and make sure you’re taking care of yourself and having fun. This lies in the equilibrium between exercise and rest, dressing up and getting cozy, throwing a rad holiday party for friends and spending time with family at home, and, of course, the necessary evenness in our beauty routines. It’s the perfect time of the year to try a new, bold lip color, shimmery eye shadow, or fun hair accessory, but it’s also important to consider how cold weather affects your skin, nails and hair (and then combat the effects of the cold weather appropriately!). We are excited to share all of this with you in our third VIOLET GREY column. Feel the merriment of the season at our favorite holiday destinations. Reason to Love: Ice-skating is a fun holiday tradition, but also an amazing workout! There is a great outdoor rink in downtown L.A. during the holiday months [Pershing Square]. Or if we’re in New York there are rinks at Central Park (above) and Bryant Park. Streicher Must: A go-to uniform of shiny leggings, leg warmers, gloves and a cape is equal parts fun and comfortable. Reason to Love: The hotel is decorated and festive during the holidays, and the spa’s scrubs, wraps and massages are luxurious and great for dry skin. Streicher Must: The Crushed Cabernet scrub followed by the Honey and Wine Wrap feels heavenly and is great to slough off dead, flakey skin. And we always finish with a 15- to 20-minute session in the steam room. Reason to Love: The Old Place is only 30 minutes away from the city but feels like you’ve gone back in time. It’s set back in the woods in an old post office, and the inside is cozy and full of history. There is normally someone playing their old piano, which Bob Dylan used to play when he would visit! Streicher Must: Bring your appetite! Old-fashioned cocktails and beers are served in Mason jars, and the food is simple and comforting. Reason to Love: We’re happy to announce we just opened our first salon! It’s a family affair, and we finally get to work together as a team. The space has a laid-back vibe and a gallery-like aesthetic. Streicher Must: We’re really excited about the “lightening strike” service: It's a 20-minute appointment where you get all three of us working on you at once for a quick makeup, hair and eyebrow touch-up. The key to a stress-free social calendar? Staying organized! Here’s what’s on our to-do list — and the products to accompany the festivities, below. KRISTIE SAYS: One of my recurring seasonal inspirations is Vera-Ellen in White Christmas. Her hand muff and matching hat are so elegant (above). JENN SAYS: Weekly mani-pedis are required during the holiday season. Not just because there are so many great polish colors out now, but because cuticles tend to get extra dry and nails brittle in the cold weather. Olive and June is our favorite spot in Los Angeles. The salon is beautiful, and they have a great selection of polishes. JENN SAYS: We see The Nutcracker every year; not only do we love the music, but the dancers, choreography and costumes are all very inspiring and beautiful. It’s an absolute must. There are many places to see a performance, but make sure it's accompanied by a live orchestra (not prerecorded music). The music is just as important as the dance! My favorite show was a year the Russian ballet performed at the Walt Disney Concert Hall. KRISTIE SAYS: We Streicher sisters love to throw a good holiday party — we do it every year! Some essentials are a glazed ham, candy and caramel-coated apples and, of course, spiked and spiced hot apple cider. THE STREICHER SISTERS' FAVORITE HOLIDAY JAMS. 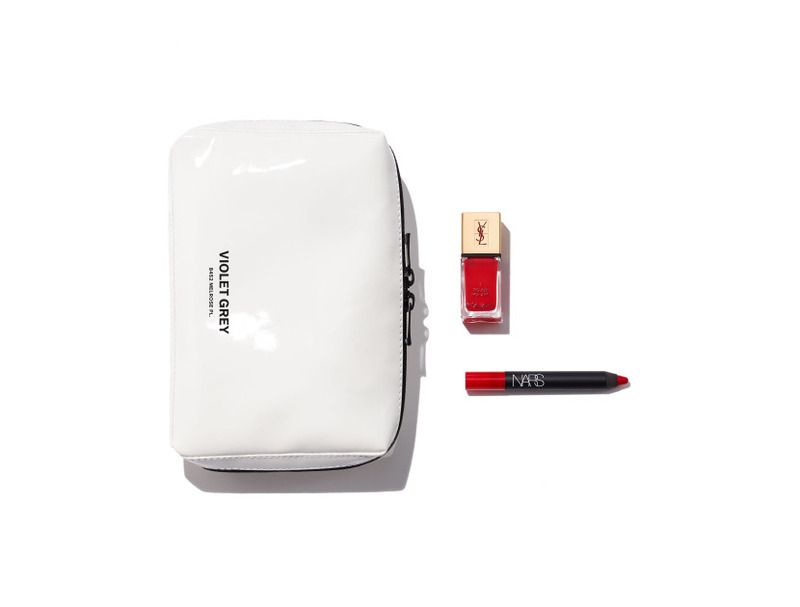 For the woman whose beauty priorities require color coordination. over the holidays includes a ‘one for you, one for me’ approach to gifting. Which hair and makeup artists were responsible for the stunning looks in VIOLET GREY's latest editorial? Why Jenn and Ashley Streicher, of course.